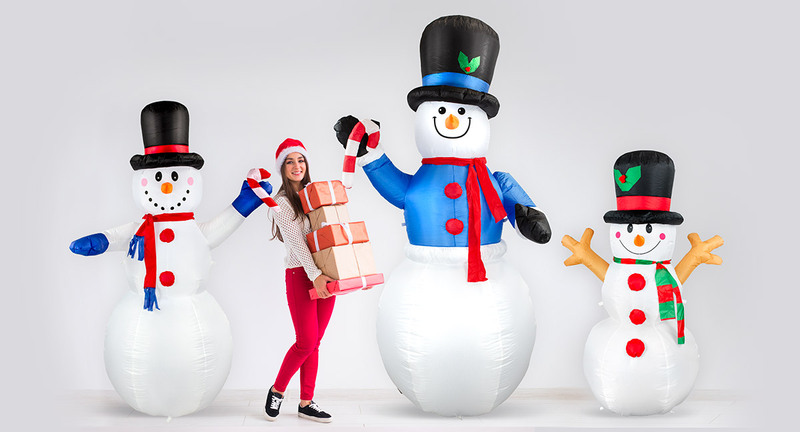 This 5' ft Snowman with Holly Top Hat and Scarf Light Up Christmas Inflatable By Comin™ makes an eye-catching outdoor lawn decoration. It's simply the perfect combination between simplicity and bold, with the two complementing each other perfectly. Added on is the wear-proof design, which improves the ability to last. This festive snowman Christmas inflatable is all ready for the holidays! With a holly top hat and a matching scarf, this inflatable snowman is ready to greet all guests coming in for Christmas. Taking on a more traditional design, it is definitely there to last for a few more holidays. Not to mention, it is water proof and tear resistant, meaning that this tradition isn't going to break anytime soon. Perhaps the best feature of this Christmas inflatable is its competitive price.